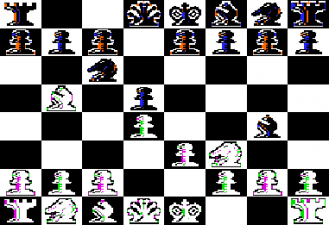 a family of chess programs by Dan and Kathe Spracklen. They started chess programming in 1977 on a Z-80 based Wavemate Jupiter III  in assembly language. The first Sargon version had a 10x12 board board representation and a two ply alpha-beta search without quiescence but a SOMA like exchange evaluation  . After first tournament successes in 1978, at The Second West Coast Computer Faire, winning with a 100% score , and the shared third place at ACM 1978 already with Sargon II, the Spracklens became professional computer chess programmers. They first started selling their well commented Sargon I Z-80 assembly listing as paper copy for $15 by their own , and then made a contract with Hayden Books to publish a book about Sargon with explanations and listing . Hayden Software  remained primary distributor of all further Sargon software versions, even when the Spracklens worked full time for Fidelity Electronics during the 80s. Sargon I was already ported to the Apple II by Kathe Spracklen's brother, Gary Shannon . Despite its lower frequency, they found the 6502 the much better processor for their program than the Z80, and soon the MOS Technology processor became the major target platform. Sargon II was written for various Z-80 and 6502 based home computers, and was base for their first dedicated unit, the Chafitz ARB Sargon 2.5 . After civil proceedings between manufacturer Applied Concepts  and their sales company Chafitz, the Spracklens began their long term collaboration with Sidney Samole and Fidelity Electronics in the 80s. Sargon II already played the ACM 1978 still with the Jupiter III, and the WMCCC 1980, where it had to compete with its dedicated relatives, winner Chess Challenger, runner up Boris Experimental, Sargon 2.5 Modular GS and Sargon 2.5 Auto RB, and became tied third with 3/5, last game losing from Challenger. Sargon III was a complete rewrite, using quiescence search, and a transposition table with BCH hashing. Sargon III was ported to the 68000, to be the first third-party executable software for the Macintosh . The 8086 Sargon III port for PC was done by Kevin Leavelle in 1984 , so that three Sargon 3 software versions played the WMCCC 1984, where the Fidelity Electronics Elite by the same authors tied for first place, the Apple II became 10th with 4/7, the Macintosh 12th with 3½/7 and the 8088 Compaq PC 17th with 2½/7. In cooperation agreement between Fidelity Electronics and Software Toolworks in 1988, an enhanced and improved Sargon III was market as Fidelity Chessmaster 2100 . I think the most exciting part for us was the last round of the tournament, when we played Tony Marsland’s program Awit. It was a 6 million dollar Amdahl computer. And we won the game. And we were just amazed. I remember, at the time, we won it. And there was a huge audience there. There was like a hundred people sitting out there, watching it, and they just all started cheering and clapping. And then we woke up the following morning to a big article in the Washington Post that says, Microcomputer Beats 6 Million Dollar Machine, or something like that. Dan Spracklen, Kathe Spracklen (1978). SARGON: A Computer Chess Program. Hayden Bk.Co. ↑ Chris Morgan (1978). The Second West Coast Computer Faire. BYTE, Vol. 3, No. 7, hosted by Modern Mechanix, Photo 4: Ira Baxter’s chess playing system display, which competed in the Microcomputer Chess Tournament at the Faire. The level of play was impressive, and the winning program, called SARGON, was a 16 K byte Z-80 assembler program written by a husband and wife team, Kathe and Dan Spracklen. This page was last edited on 27 November 2018, at 23:27.